Today is Part I of a super-fun project that myself and the other Think and Make Thursday link party ladies were invited to take part in, and Part II will be here tomorrow with a roundup of all our posts and a giveaway! We were all given our choice of the really cool fabric from AlwaysMod and then challenged to work our DIY/creative magic and make something with it. 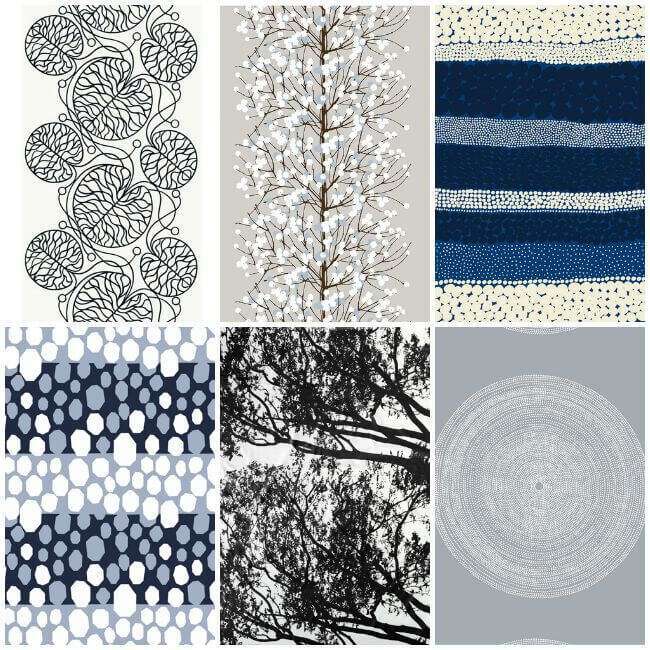 AlwaysMod has a hefty selection of modern Marimekko fabrics in all different patterns, styles, and colors. Now, y’all know my style isn’t much on the modern side, but I had a seriously hard time picking just one out! Here are the ones I agonized over (click to see each one), finally settling on the top middle one, the Marimekko “Lumimarja” in grey/blue. I had grandeur plans to make some new outdoor pillows for our patio set so I chose the PVC-coated version of the print. But, I haven’t pulled out the sewing machine in a couple years (shamefully I know), so I figured this may not be the best time to attempt such a feat, especially with the PVC-coated fabric. 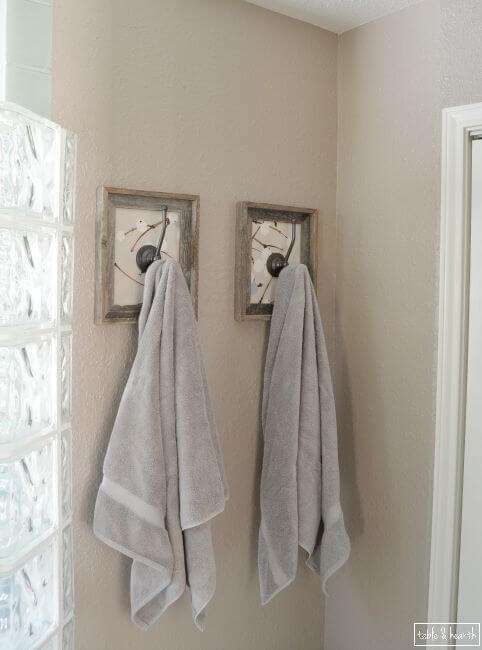 But it ended up being perfect for another area that’s needed some work/pizzazz, our master bathroom towel hooks. Now, our master bathroom got a well-deserved update a year or so ago, and these hooks were a nice upgrade from the ugly bar we had before, but they still looked just so meh and tiny on the wall. I wanted to bring them a little more weight and make them more visually interesting, so I decided to use my fabric and some rustic frames to frame them out. 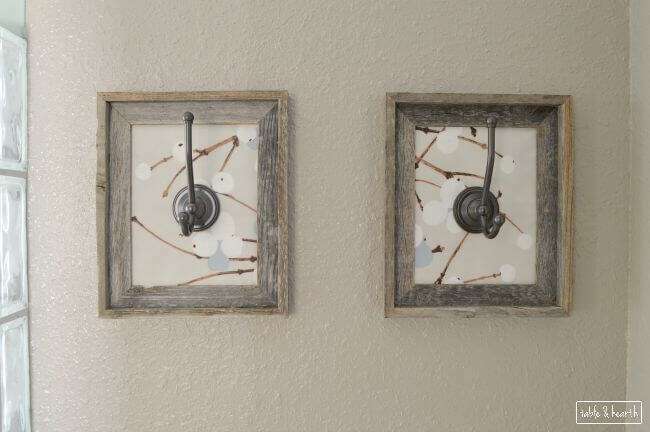 First, you’ll want to take your hooks apart and unscrew the mounting bracket so you can use it as a template. 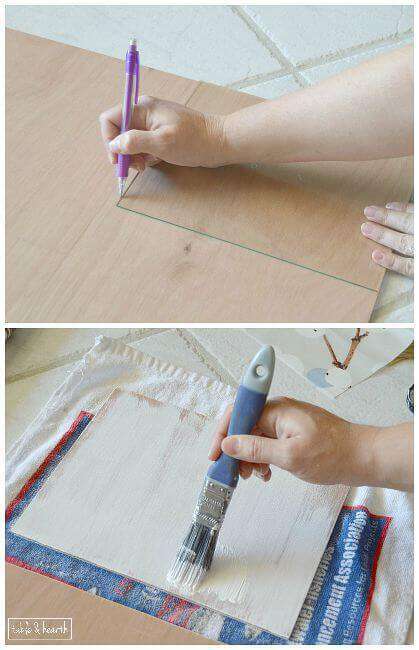 Remove the glass from your frames and trace its size onto whatever section of the pattern you’d like to use, then cut it out. The fabric needs to be mounted with something flat to hold it shape, so I cut out the same size piece from a 1/8″ thick panel board and cut it out with the jigsaw. The wood made my fabric a little darker so I put a quick layer of white chalk paint on my board. Now, take your mounting bracket and center it on the board, then mark where the screw holes need to go and drill them out. 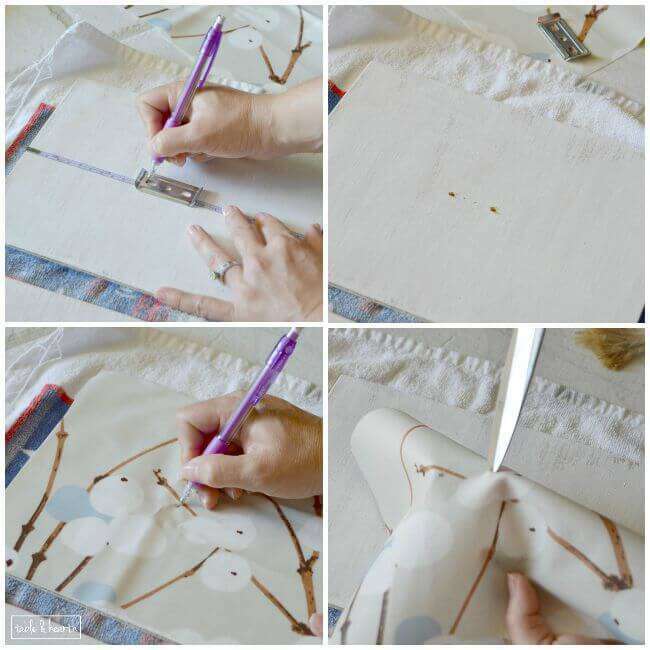 Place your fabric over the board and make marks on it where the screw holes are. Then do a little snip in the fabric at each mark. 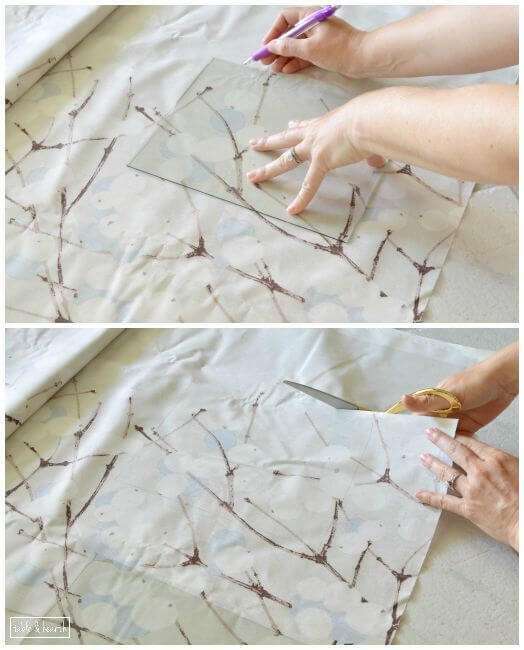 Place the fabric on the board and clip it back into the frame and you’re ready to mount. 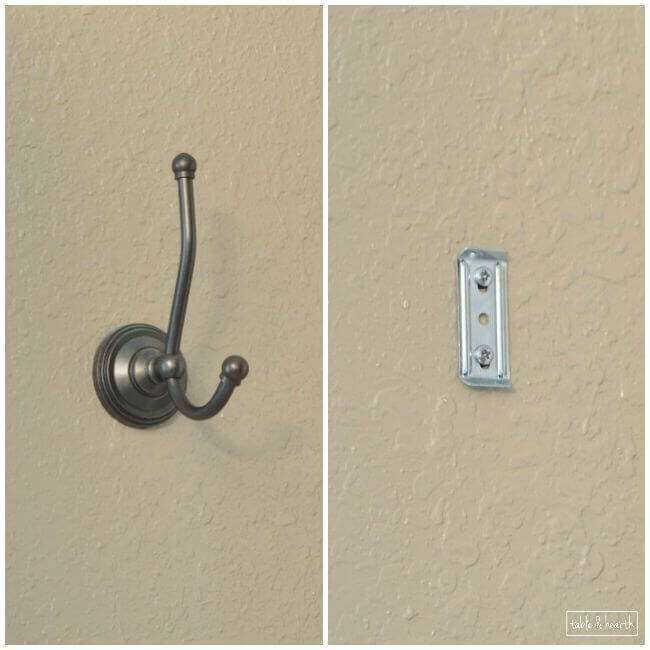 Screw the screws back in through your holes then put the hook back onto the mounting bracket. The nice thing is that the screws hold your frame to the wall so you don’t have to mount the actual frame at all. But, it did take a bit of finagling with both hands, a flashlight in the mouth, and some cursing to line the screws up with the anchors again, but they finally went. 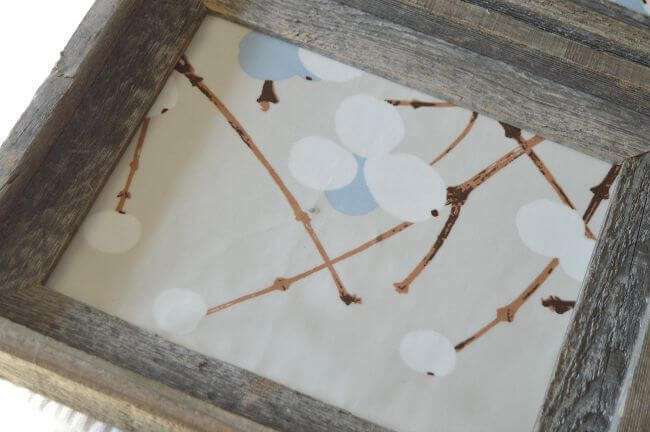 I LOVE this print with the grey, dark wood, white, and greige colors we have in here, and the rustic frames keep it casual. This space looks sooo much more even now! And they nicely distract from the litter box that sits below them (#keepinitreal). Now, make sure to stop back by tomorrow to link up, check out everyone else’s projects, and enter to win your very own AlwaysMod fabric!! Great idea Emily! Turned out really pretty…adds so much more to that wall now! These turned out beautifully, Em — what a simple and lovely way to spruce-up a forgotten corner of a room. Neat-o! Absolutely BRILLIANT and SO pretty!!! What a lovely update! Those are beautiful! So cool! Your hooks seem so much more important and noticeable now! 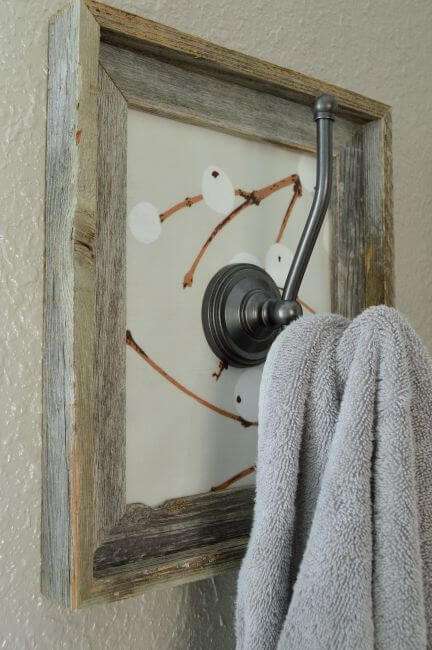 A nice and rustic addition to your bathroom! 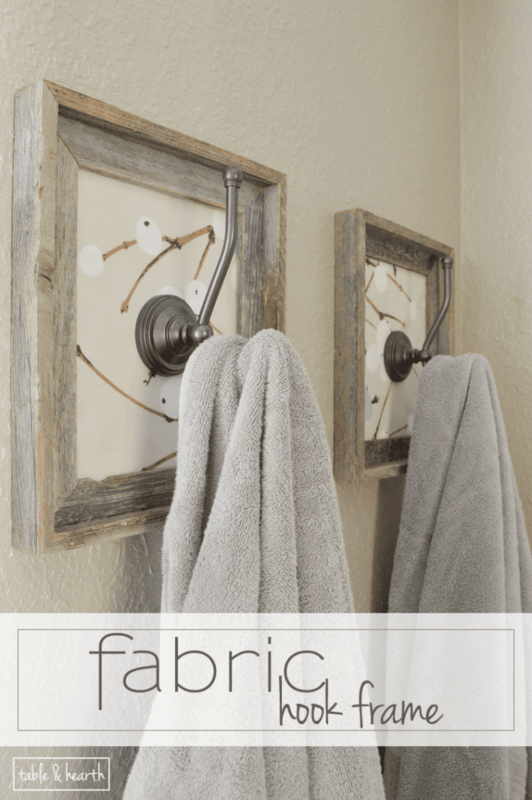 The fabric and frame add so much OOMPH to the hooks. They’re really nice! Hi! I saw them on Your Turn to Shine and had to stop by to say they are gorgeous! What a difference a frame can do! Aw, thanks for hopping over! It’s crazy right?! Great looking. I’ll have to try this since I’m redoing the pool house. These are just so much more than hooks. They are works of art! I am in love with this!! Thanks for sharing on the Monday Funday Party. Pinned to our group board. Aw, thanks so much Amy!!! And thank you for hosting! These are so beautiful! 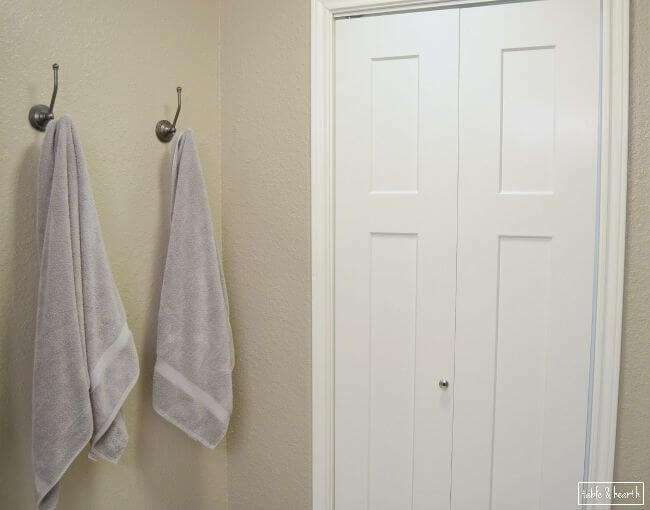 what a great way to add some personality behind your towel hooks. I may have to steal this idea! thank you for stopping by our Dream. Create. Inspire. Link! Party! I’ll be pinning and sharing! Go for it Cat!! Thanks for the great party! Awesome, thanks so much Mandee!! LOVE y’all’s party! !